Two interesting observations about Scooter's debut. 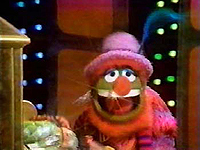 His entrance is in conflict with the Muppet Movie which shows him being the Electric Mayhem's road manager and Muppet Babies where he grows up with the other characters. While some fans lose sleep over this, this is hardly a serious contradiction as we're reminded throughout the Muppet Movie that it is just a movie, one with an alternate "history" (indeed if the films were to be taken at face value, they all contradict each other) and the Muppet Babies is also to be thought of as "just a cartoon" BASED ON the characters. 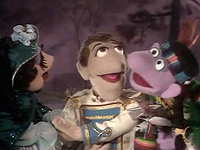 The babies' Muppetized debut in Muppets Take Manhattan was part of a dream sequence. (But then there's the home movies of the Muppet Babies the Muppets watch in Muppet Family Christmas, Scooter included, but don't lose your head pondering this). This is episode 6, and Scooter's already appeared in episodes 1, 2, and 4! 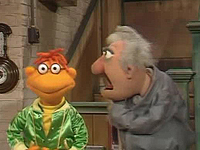 The first two episodes were shot before the rest as "pilots" so obviously the writers thought once the character was established that it would be fun to explain Scooter's entry. If it helps, think of this as somewhat of a "flashback" episode. 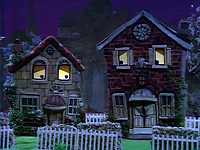 A number of early episodes didn't include Scooter in them so they could be aired before this one as to not cause confusion. 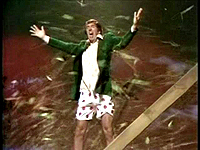 (Indeed, in some markets the Scooter-less Rita Moreno episode was the debut, but in others the Jim Nabors show was the second to air after the Sandy Duncan one which included Scooter. Since the Muppet Show was in syndication, meaning that episodes might air in different orders in each market, the writers probably didn't worry too much about this. 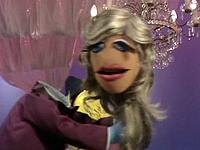 Annie Sue's "debut" episode in season 3 also aired after the audience had seen her, and was also done after the character had been used. The original name for Miss Piggy was Miss Piggy Lee. This idea was quickly scrapped though the first Muppet Show Annual refers to her as such as well as a few articles around the time. The Talk Spot in this episode is the only time in the series where Piggy is addressed as "Piggy Lee". Brian Henson: "Hi, I'm Brian Henson. How do you explain the success of The Muppet Show? Well there were certainly a lot of important factors: like the guest stars, the outrageous Muppet characters and some perfectly absurd stories and sketches." "But at the center of all of it was Kermit. Kermit was my father. My father first made Kermit out of a coat that belonged to my grandmother and through the years Kermit changed a little bit, looked a little bit different. and eventually became the Kermit that we all know. But what's wonderful about Kermit is he's the glue that holds all of these crazy zany characters together. Here it is, The Muppet Show." Fozzie's joke: "My cousin is so thin he paints his head gold and rents himself out as a flagpole." Gonzo's gong: The gong part of the "O" is missing so Gonzo hits his head. Kermit mentions the show is done at the Benny Vendergast Memorial Theater; since the Muppets owe everything (especially three months back rent) to Benny, Kermit presents Dr. Teeth with "Money"
Dr. Teeth sings a "financially substantial" ode to the green stuff (the cash, not the frog!) while jamming at the piano. At the song's conclusion, Dr. Teeth pulls a handle and money comes pouring out of the organ a la a Las Vegas slot machine. STATLER: They don't write the old songs anymore. WALDORF: Nah, they only write new ones. A young kid named Scooter introduces himself to Kermit as his new go-fer (he'll go fer coffee and sandwiches). Kermit declines to hire a youngster with no experience, especially with no money in the budget. Couldn't he just "hop on" Dr. Teeth's piano? Then Scooter mentions his uncle owns the theater. House 2: My wife's not feeling well... she's got the shingles. 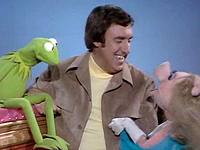 Kermit gives a real Muppet Show welcome to guest Jim Nabors. MUSICAL NUMBER - "GONE WITH THE WIND"
WALDORF: That Jim Nabors is a real good sport, a real good singer. STATLER: I used to live next door to him - he was a real good NABOR! Scooter starts to play Talent Coordinator as he persuades Kermit to put on the Danceros, his uncle's favorite act. 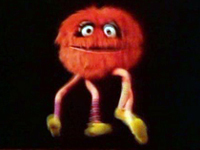 A close up of two pairs of legs pan back to reveal a large Muppaphone-ish quadrupled who gets his legs all tangled up. Jim encourages Animal to break a leg, not something one wants to tell Animal to do! Kermit unloads Scooter on George the janitor, who brags he's been with the theater. from the beginning and starts complaining about the new guy who bought it and ruined it. Once he realizes this kid is the owner's nephew, he quickly changes his tune. GEORGE: What's a theater without problems?" 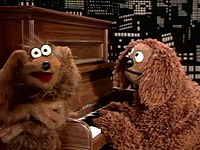 Jokes include Rowlf's coming down with the Asian Flu; his doctor advised "take two fortune cookies and he'd call to call him in the morning". UK SKIT: MUSICAL NUMBER - "DOG EAT DOG"
Miss Piggy joins in, flirting with Jim. The topic turns to astrological signs. (Kermit: "Hey listen, I'm a Tauris...I'm a bull frog.") Jim demonstrates how he lives up to the double-personality aspects of the Gemini since he talks kind of goofy but sings more operatic. Kermit doesn't seem to appreciate his singing as much as Piggy does. 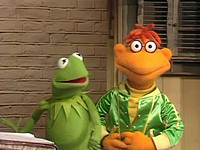 Fozzie complains to Kermit that the new kid keeps following him around giving him awful jokes for his act. The "terrible" jokes ("I stayed at a hotel so exclusive, room service had an unlisted number") manage to draw huge laughs out of the backstage crowd. Sam introduces the world's "finest and most morally unobjectionable singing team". WAYNE & WANDA - "INDIAN LOVE CALL"
INDIAN: Hey Baby, you called? WALDORF: Why did we laugh at that terrible joke? STATLER: Either we're getting soft or we're in the first stages of senility. Jim plays a night watchman at Benson's Bakery. 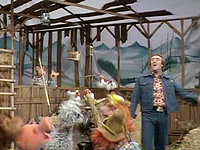 Rowlf enters and puts up his hens: a couple of chickens. 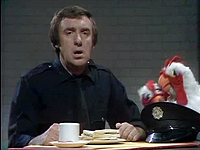 Jim's thick Southern accent keeps eliciting more misunderstanding, prompting Rowlf to bring in more animals. JIM: Don't move a hair! What's that? ROWLF: That's the hare I'm not supposed to move. 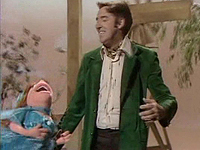 Kermit brings on Jim Nabors. 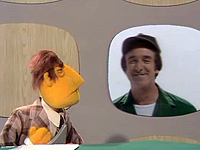 CLOSING NUMBER - "THANK GOD I'M A COUNTRY BOY"
Jim tells Kermit how appreciative he was of Scooter, who picked up his coffee, his wardrobe, his accent... Kermit warns him to be careful of him picking up Jim's paycheck. WALDORF: Pay up, they made it through another one. STATLER: Double or nothing, next week's show?